The Wilson desk is a large mahogany desk used by Presidents Richard Nixon and Gerald Ford in the Oval Office as their Oval Office desk. Purchased between 1897 and 1899 by Garret Augustus Hobart, 24th Vice President of the United States, for the Vice President's Room in the United States Capitol, it is one of only six desks used by a President in the Oval office. When Nixon was elected President, he chose this desk because of his belief it was used by former President Woodrow Wilson in the Oval Office. 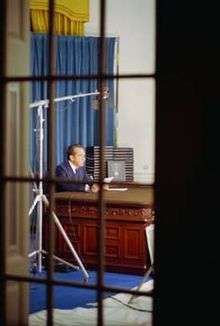 In 1971 Nixon had five recording devices secretly installed by the United States Secret Service in the Wilson Desk. These recordings constitute some of the Watergate tapes. 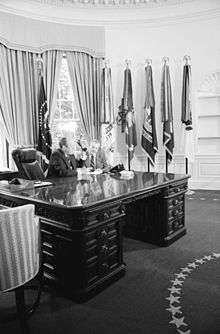 Nixon referred to the desk in 1969 in his "Silent majority" speech stating, "Fifty years ago, in this room and at this very desk, President Woodrow Wilson spoke words which caught the imagination of a war-weary world." In actuality the desk was never used by Woodrow Wilson in the Oval office. Nixon was informed by one of his speech writers, William Safire, that the desk was actually used by Vice President of the United States Henry Wilson, under President Ulysses S. Grant's administration. This also appears to be untrue as the desk was not ordered until 1897 or later, more than 22 years after Wilson's death. The "Wilson Desk" appears to be a misnomer as it has never been continuously used by anyone with the last name of "Wilson." Richard Nixon meeting with chief advisers around the Wilson desk in the Oval Office. The Wilson desk is a double-pedestal desk built of mahogany. Its workspace is roughly five feet by seven feet and it has drawers in both pedestals. The knee-hole extends all the way through the desk. During its time in the White House a glass top was used on top of the desk. This sheet of glass covered the whole workspace of the desk. According to the book Presidential anecdotes by Paul F. Boller, Nixon enjoyed working in the Oval Office with his feet propped up on the Wilson desk and, in spite of the glass cover, Nixon's "...heels began leaving scars on the top of it." Someone at the White House noticed the marring of the historic desk and, while Nixon was out of the United States, had it refinished. When Nixon returned and saw what had been done he supposedly stated, "Dammit. I didn't order that. I want to leave my mark on this place just like other Presidents!" Garret Augustus Hobart in the Vice President's Room of the United States Capitol leaning on the Wilson Desk. Garret Augustus Hobart was the 24th Vice President of the United States serving from 1897 to 1899 under President William McKinley. While in office he purchased and ordered many lavish furnishing for the Vice President's Room of the United States Capitol, (room S–214) then the official office for the vice president. The furnishings either purchased or ordered by Hobart included Persian rugs, mohair carpeting, Neapolitan silk curtains, "a silk velour slumber robe" to match the velour cushions on his office sofa, a $600 floor clock from Harris and Schafer jewelers, and the large mahogany desk now known as the Wilson Desk. The desk which Hobart bought remained in the Vice President's Room and continued to be used by each Vice President. This use of the desk continued until 1969 when the desk was placed on loan to the White House so that it could serve as the Oval Office desk for Richard Nixon's presidency. Nixon took a liking to the desk during his terms as Vice President because he was under the incorrect impression that it was used by Woodrow Wilson during his term as President. Nixon asked for the desk to be moved from the Vice President's Room to the Oval Office upon his inauguration as President. During February 1971, Nixon had a secret audio recording system installed in the Wilson Desk. The president's offices in the White House, Camp David, and the Old Executive Office Building all had hidden microphones installed by the United States Secret Service, and some of the recordings created by this system make up the Watergate tapes. There were seven microphones in total installed in the Oval office, one on either side of the fireplace and five located within the Wilson Desk. These microphones, as well as recording devices in the Cabinet Room were all wired to central mixers and recorders in "an old locker room in the White House basement." Not long after April 9, 1973 a switch was installed in the desk to allow Nixon to turn the microphones on and off at will. Previously they turned on automatically whenever someone began talking. Throughout Nixon's presidency he referred to the Wilson desk hundreds of times in official speeches, such as the "Silent majority" speech, and in talks with high ranking visitors. During official White House tours, guides wrongly told of how Woodrow Wilson used the desk. This misconception was first discovered to be untrue by an assistant curator at the White House. This assistant curator came to yet another incorrect conclusion about who had previously used the desk. This curator wrongly stated that the desk was not used by Woodrow Wilson, but instead by Vice President Henry Wilson, under President Ulysses S. Grant's administration. The assistant curator enlightened Cecilia Bellinger, a chief researcher in the writing operation at the White House, about the mistake who in turn told William Safire, one of Nixon's speech writers. It fell to Safire to inform Nixon about the mistake in the provenance of the Wilson Desk. Safire was chosen to inform the President of the issue because he was, "the most frequent Wilson-quoter on the writing staff." Safire wrote a memo to Nixon explaining that it was Henry Wilson, not Woodrow Wilson, who sat at the desk, and listed a litany of character traits and virtues of the other "Wilson." Safire heard nothing back from the White House about the memo. The only recognition Nixon's White House gave to their major mistake in the provenance of the desk was in 1969 when on page 909 of that year's edition of Public Papers of the Presidents there is a footnote to Nixon's "Silent majority" speech which states, "Later research indicated that the desk had not been Woodrow Wilson's as had long been assumed but was used by Vice President Henry Wilson during President Grant's Administration." This footnote itself is also in need of a footnote as the Wilson desk was not ordered until 1897 or later by Garret Augustus Hobart, more than 22 years after Wilson's death and therefore Henry Wilson could not have used the desk. "Fifty years ago, in this room and at this very desk, President Woodrow Wilson spoke words which caught the imagination of a war-weary world." "Later research indicated that the desk had not been Woodrow Wilson's as had long been assumed but was used by Vice President Henry Wilson during President Grant's Administration." 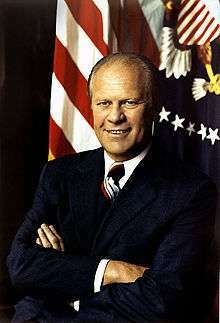 After Nixon's resignation from office in 1974, the desk remained in the Oval Office throughout Gerald Ford's tenure as President. Ford changed much in the Oval Office including artworks, rugs, window treatments, and he even oversaw the removal of less than public entrances into the room, but the Wilson desk was one of the few things he left in place. The desk stayed in the Oval Office until 1977 when Jimmy Carter became President of the United States. Carter replaced it with the more widely known Resolute desk. The Wilson desk was returned to the Vice President's Room at this time, where it has remained since. During the two time periods the Wilson desk was located in the Vice President's Room, before and after it was loaned to the White House, no Vice President has had the last name of "Wilson." Because of this, the "Wilson desk" has never had a "Wilson" use it on a regular basis, but a marble bust of Henry Wilson, the Vice President mistakenly believed to have used the Wilson desk, does sit in the Vice President's Office near the Wilson Desk. This bust, commissioned in 1885, "served as the genesis for the Senate’s Vice Presidential Bust Collection." Below is a table with the location of the desk from its purchase by Garret Augustus Hobart to present day and each tenant of the desk. A replica of the Wilson desk is located in the Gerald R. Ford Presidential Museum, in Grand Rapids, Michigan, as a part of a full-scale replica of the Oval Office furnished as it was during Ford's presidency. ↑ The Wilson Desk. Snopes.com. August 16, 2007. Retrieved October 12, 2011. 1 2 3 4 5 6 7 8 The Vice President's Room. Page 6. U.S. Senate Commission on Art by the Office of Senate Curator. Senate Publication 106–7. Retrieved October 12, 2011. ↑ Nixon. The Virgin Islands Daily News. January 23, 1969. Retrieved October 12, 2011. 1 2 Boller, Paul F. Presidential Anecdotes. pp. 328. Oxford University Press. 1996. 1 2 3 4 Hatfield, Mark O. with the Senate Historical Office. Vice Presidents of the United States 1789-1993 : Garret A. Hobart (1897-1899). U.S. Government Printing Office. pp. 289-293. 1997. Retrieved November 2, 2011. 1 2 3 4 5 6 7 Safire, William. Before the Fall: an inside view of the pre-Watergate White House. Pages 104-106. Transaction Publishers, 2005. ↑ History of the White House tapes. Nixon Presidential Library and Museum. Retrieved November 4, 2011. ↑ Reeves, Richard. President Nixon: Alone in the White House. pp. 593. Simon and Schuster. 2001. ↑ Sidey, Hugh. Subtle Changes in the Oval Office. Time magazine. January 13, 1975. Retrieved October 16, 2011. ↑ At Work in the Oval Office. Gerald R. Ford Presidential Library and Museum. Retrieved October 28, 2011.